You may have already seen some of these pictures on my Instagram feed, but I wanted to share them here as well and give you a bit more info on the project. 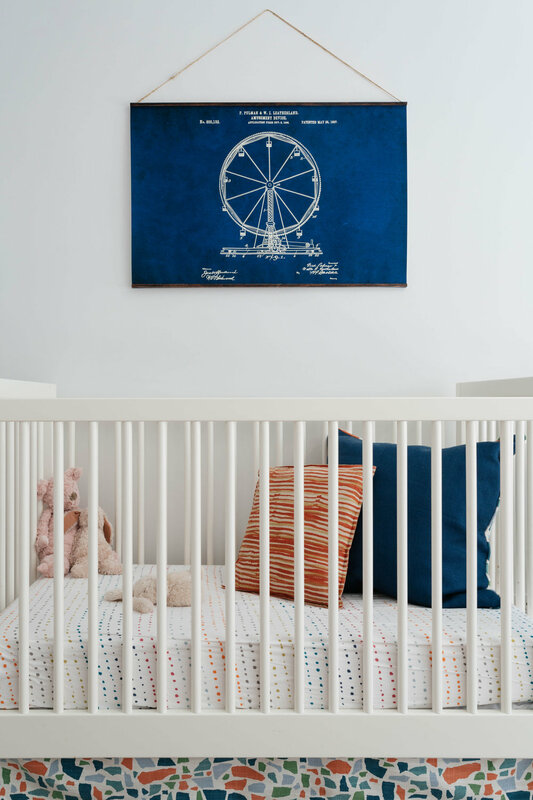 When the clients approached me, this room had been a nursery for their two-year-old daughter but, with a baby brother on the way, it needed to transform into a space that could be comfortable for a toddler and an infant. As with any home project, while they were willing to put the time and energy into the room, they also wanted to think about the future and design a space that would work for years to come. The biggest challenge for me was figuring out the beds. Obviously the baby needed to be a in a crib and their daughter would graduate to a "big girl bed." I personally find rooms with a crib and twin bed to be a little jarring. I know it's irrational but the different scales of the bed drives me crazy. To combat this, I decided to use a daybed instead of a regular twin bed. I was also concerned about what would happen three years from now when their son was ready to graduate from a crib. I saw a few options. 1. We could do a store-bought daybed (say something from Land of Nod) and hope that it was still being produced in three years. A big gamble at best. 2. We could do a store-bought daybed and get a mis-matching bed for their son down the road, but I'll admit this "wing it" attitude didn't sit well with me. 3. We could buy a bunk bed and only assemble one portion, then store the other bed until both of the kids were ready. This is assuming that somewhere in their apartment they could house a disassembled second bed. It's also assuming you like the look of bunk beds, and one of your children is willing to sleep on the top bunk. To be honest, none of these options seemed great. Most importantly, because they all felt like I wasn't quite finishing the job by giving them a room that would only work for three years. After a lot of playing around, I ended up designing a custom daybed. For now, the ends of the daybed act as a headboard and footboard for their daughter, but in three (or so!) years when their son is ready to leave the crib, the panels will come apart and will be two separate headboards for twin beds. I gave the clients a layout for the room now, as well as layouts for the room down the road, with two twin beds and a desk replacing the glider. We gave their daughter a few options of patent prints and she picked out the carousel. I couldn't have chosen better myself. We had to be strategic about how high to make the sides of the daybed. We wanted them to be tall enough to eventually transition to headboards, but not so tall that they would look awkward as a daybed now. Not to toot my own horn too much over here, but I usually tell people design is 10% creativity, 20% problem solving and 70% execution and project management. The 20% is often some of the most rewarding work because you're helping people figure out the best way to live in their space, spend their money and design a room that really works for them. All photos are by the very talented Nick Glimenakis.